Manchwidang is the name of a building established by Kim Sa-won (1539-1601), a pupil of the great Neo-Confucian thinker Yi Hwang (pen-name: Toegye, 1501-1570), for use as his personal study and as a school in which to educate local youths. The building features numerous plaques bearing poetic works written by distinguished men of letters of the mid-Joseon period including Yi Hae (pen-name: Ongye, 1496-1550) and Ryu Seong-nyong (pen-name: Seoae, 1542-1607), and a name plaque handwritten by Han Ho (pen-name: Seokbong, 1543-1605), who is generally regarded as one of the greatest calligraphers of Joseon. 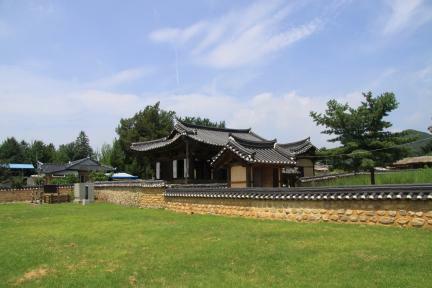 A record of the renovation of the house shows that its construction was begun in 1582 (15th year of the reign of King Seonjo of the Joseon Dynasty) and completed two years later. The house underwent three major repair and renovation works (1711, 1727, and 1764) to acquire its current T-shaped layout. The house has considerable historical and aesthetic value due to the good condition of the original structures, including those supporting the roof, and the architectural modifications undertaken to meet the culture of the aristocratic literati and social demands of mid-Joseon.